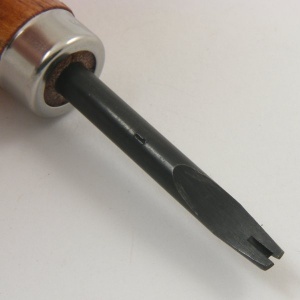 Edging tools are excellent for rounding off the sharp corners that are found on cut edges of thicker leathers. After cutting a strip to make a belt, dog collar or piece of horse tack, the next stage is to round off the corners using and edge tool, otherwise known as an edge shave. 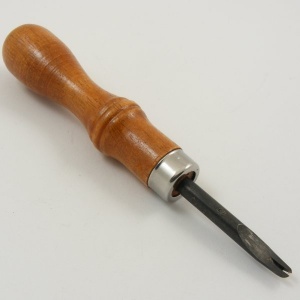 This is a No1 edge tool, which takes off the smallest margin. We also sell a No2 edge tool which will leave a more pronounced rounded edge to your work, by approx another millimetre.